One of the first places a visitor to your home gets a taste of your style and personality is at your front door. So let your creativity shine there! 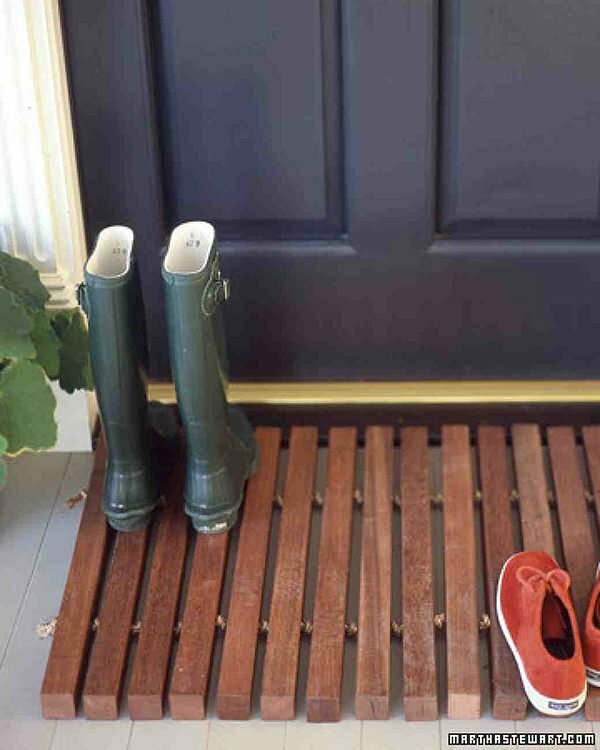 Make these DIY custom front door mats to welcome family and friends, and let them reflect you and your family. Are you colorful? Simple? Traditional? Choose a project here that lets you create a door mat that is one of a kind. This wooden door mat by ‘Martha‘ is made of materials that will last, and is great in areas with a lot of weather. It drains away any water tracked up from snow or ice, and is heavy enough not to blow away in the wind. Ok, here is the one for all you color lovers! 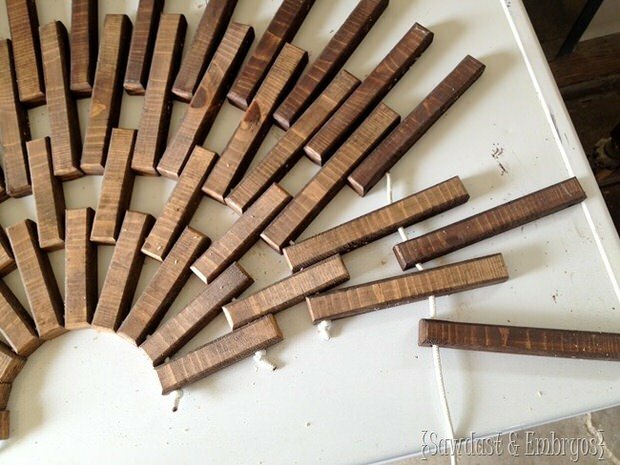 This DIY wooden front door mat was done by Britta via ‘One Good Thing by Jillee‘. she makes it look so easy! Remember, you could choose any colors! How about an ombre look with various shades of the same hue? Like the idea of a wooden door mat, but want a little more style? Try this half circle door mat tutorial from Beth at ‘Sawdust & Embryos‘. Simple instructions walk you through this project. It looks like a mat you might find at an expensive home store! 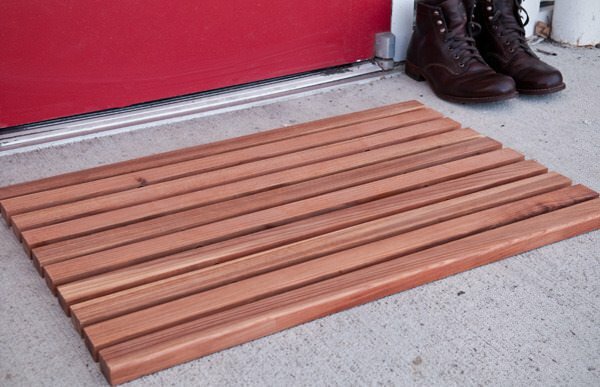 If you are looking for a DIY wooden door mat that will last, this is it. From ‘Man Made DIY‘, get step by step photos and instructions for this high end looking, long lasting door mat made from brass and redwood. Lot’s of tips on how to make this last through nasty weather and time! 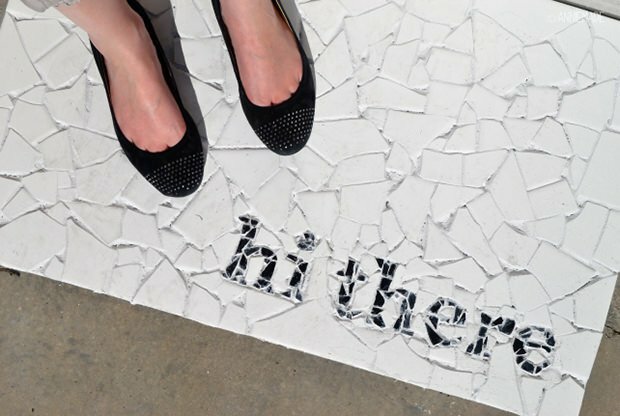 From ‘Annie Made‘ this DIY door mat is made from ceramic tiles, and has a fun message! She includes the template for the message in the mosaic. Very good instructions, and this is a cool medium for those who want to do a door mat that is a little unexpected! 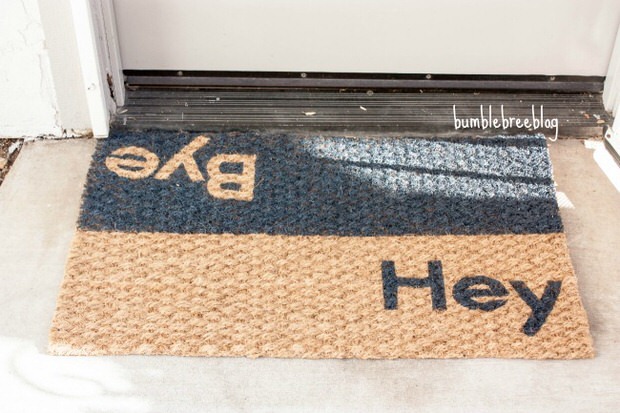 This Anthropologie hack front door mat cost Bree at ‘Bumble Bree‘ just $7 to make! I love the message for those coming, and going! 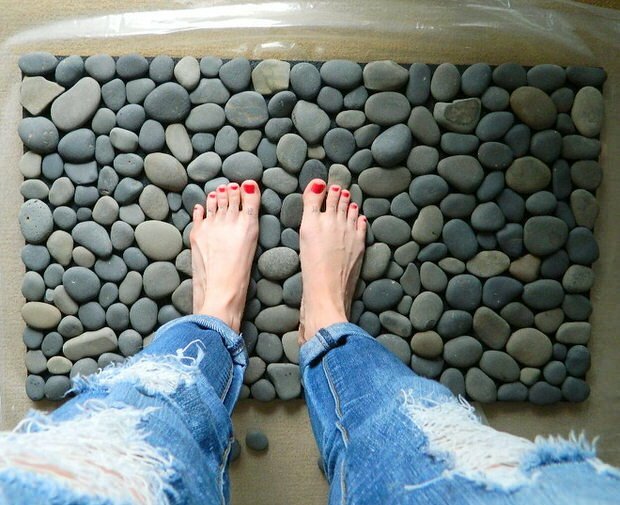 From ‘Tattooed Martha‘, this ocean stone mat is meant for a bath, but could just as easily make a great door mat! And she shows you how to make one that is not slippery, also great for the front door! Plenty of good tips and supply recommendations. 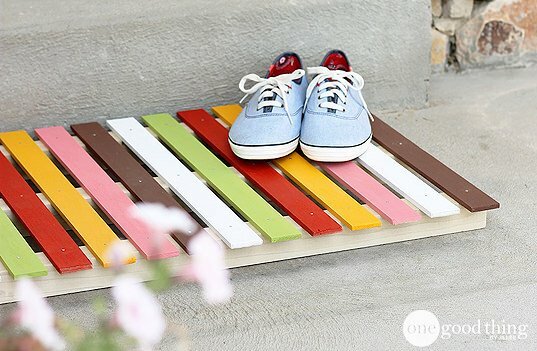 Since we love color, we thought this one just has to be done by one of our DIY’ers! 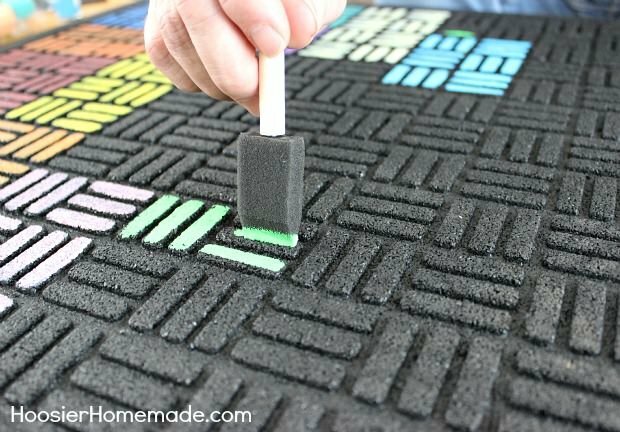 ‘Hoosier Homemade‘ has a great tutorial on how to paint a recycled rubber front door mat. They even have a pdf of the template they used for the colors you can download. Foam brush and colorful paint! 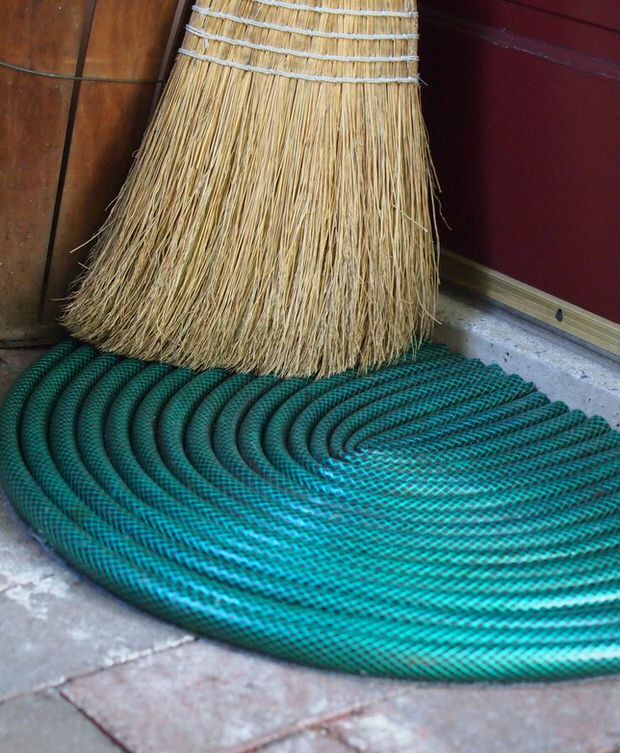 ‘Mark Kintzel‘ shows us how to make this eco friendly recycled garden hose door mat that would be the perfect statement for a back door coming in from the garden. 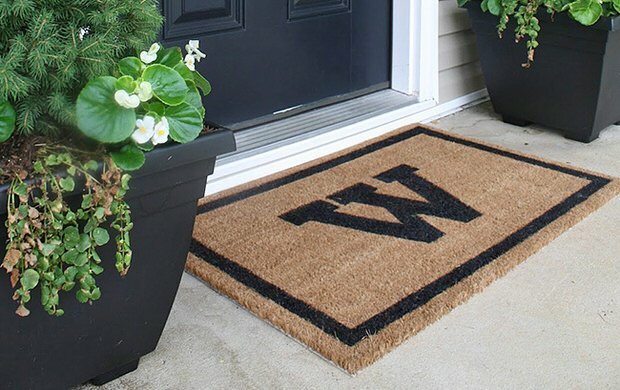 We LOVE these front door mats you can make! We think you will also love our posts on DIY area rugs, and DIY Projects for a Bright & Cheery Home! Where can i get a blank doormat to paint? ?